George William Elliott. 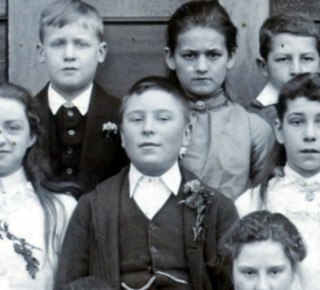 aged 12, seen in the Muston school photograph of 1902. 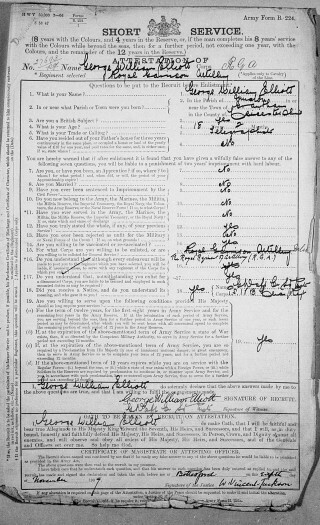 George W Elliott's Attestation paper, from 8th November 1907. George W. Elliott was a Muston man, through and through. However, he survived WW1 and, of course, does not appear on the War Memorial. He is not on the Absentee Voters list of 1918, nor is he mentioned in the 1911 Census of Muston. He only came to our attention from the mention of his home leave and wedding during May, 1916, in the Grantham Journal. In 1901, George and Mary Elliott, and their only son George William, lived on Grantham Road, Muston. George was a railway platelayer, born about 1845 in Muston His wife, Mary Elliott (nee Foottit), was born about 1847 at nearby Great Gonerby. George junior was eleven years old, born in 1890 in Muston. In 1911, George Elliott (senior), now 66, was living with his second wife, Eliza, in Duke’s Row, Muston (nowadays Duke’s Cottage). At this time, Duke’s Cottage was a short terrace of four small worker’s cottages, which still stand today though converted into two spacious cottages. George had married Eliza Clarke in 1909, after Mary Elliott had died. Eliza was also 66 in 1911, and came from the village of Marston, Lincolnshire. However, George William was not living with his father at this date, having enlisted with the army a few years earlier. George William Elliott married Daisy Elizabeth Ward, who came from Swaffham, Norfolk, on 11th May 1916, at Muston. The couple later had a daughter Florence May. In 1918, he confirmed that his next of kin was his wife, Daisy Elliott, who at that time was living c/o Mrs Southgall, Mount Pleasant, London St, Swaffham. However, after the war the couple set up home in Muston, where they remained at least until 1928. The Electoral Roll of 1924 records that George W. Elliott and Daisy Elliott were living at The Pebbles, Muston, while his father and wife Eliza were still at Duke’s Row. This was still the case in the Electoral Rolls of 1926 and 1928. However, it is not at present certain which house in Muston ‘The Pebbles’ refers to. The good quality of the set of service records for George W. Elliott available online from the National Archive enables his service career to be reconstructed. George William Elliott enlisted at Leicester on 8th November 1907, as 27693 Royal Garrison Artillery. He was 18 years 2 months old, a Methodist, and gave his occupation as “telegraphist”. His Attestation paper was signed by Canon W. Vincent-Jackson, rector of Bottesford. 11/7/1907 He was at Dover. 23/9/1908 – Posted to 26th Coy (Company), RGA (Royal Garrison Artillery) at Gibraltar. He served with the RGA in Gibraltar for about four years, from 23/9/1908 to 30/9/1912. He then spent a period back in the UK undergoing training in gunnery, from 1/10/1912 to 15/2/1915. He became qualified as a 1st Class Gunner on 1/1/2/1909. He served in France for about four years, from 16/2/1915 to 15/1/1919. 6/5/1916-13/5/1916 – While serving with the 10th Siege Battery, he was granted leave to visit the UK. This was when he and Daisy Ward married. 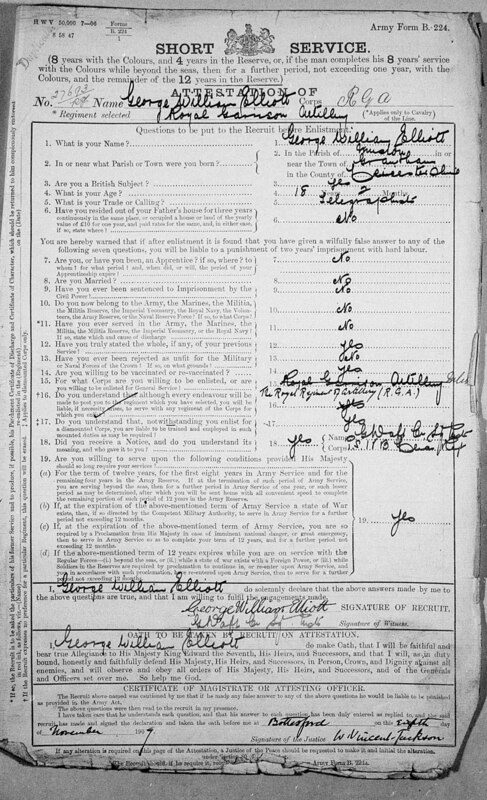 5/6/1916 – Restoration of his Proficiency Pay Class I (this presumably relates to his having been charged with being absent without permission on 25/5/1916 – see below). His last period in the army was spent in the UK, from 16/1/1919 to 7/11/1919. 7/11/1919 – final discharge at Dover from the army, home address: Muston, Bottesford, Notts. His record is perhaps notable for the lack of evidence of serious injury or sickness. During a service career of some twelve years, he never received promotion. On the other hand, throughout this time, there are records of only two minor breaches of discipline. On 27/11/1914 he over-stayed leave by 12½ hours, and was docked 7 days’ pay. Potentially more seriously, on 21/5/1916, a week after returning from the period of leave during which he got married, he was accused of “in the field, leaving his billet without permission” for which he was deprived of five days’ pay by Major C.W. Collinswood, RGA. During the time he spent in France, presumably involved almost continuously in the fighting, he only received one period of leave each year. His character was described as “very good, a sober, honest, intelligent, hardworking man”. He was awarded the 14-15 Star, the British War Medal and the Victory Medal.